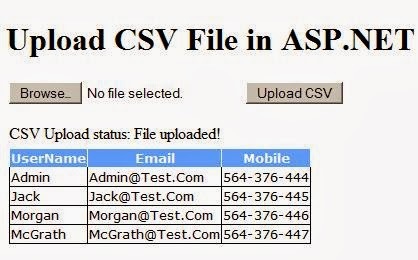 Here, we have used ASP.NET's FileUpload control to browse CSV file location and GridView control to show Imported CSV file data. <asp:Button runat="server" ID="btCSVUpload" Text="Upload CSV"
We can read data from CSV file in many of custom ways. In this article, we are going to read or import data from CSV file into .NET DataTable by using TextFieldParser. don't try to search this class in C# library because which is not available in C#. TextFieldParser is the Visual basic class. So we need to add reference dll Microsoft.VisualBasic. This is the C# ASP.NET CodeBehind to read or import CSV file into ASP.NET GridView. The ASP FileUpload control will give only file name and HttpRequest object. So, we need to read data from HttpRequest object and save CSV file locally, then after uploaded the CSV file content in GridView, we can delete that file. 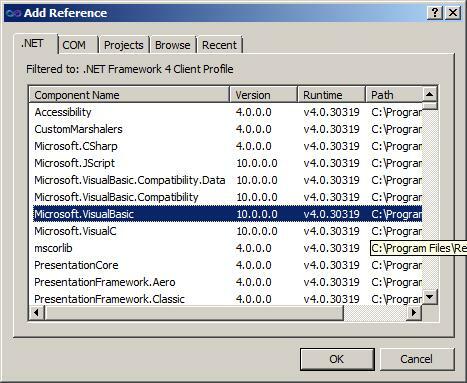 Note: Do not forgot to include the Reference Microsoft.VisualBasic to use TextFieldParser class. lbStatus.Text = @"CSV Upload status: The file could not be uploaded. If your CSV file don't have the column header, you can just remove this line. "The following error has occured: Input array is longer than the number of columns in this table. " Hi morgan,How can i read the binded Gridview row so that i can check some column and will be able to Insert into database?